A fellow in Brigham City, Utah was out duck hunting with his dog when he accidentally got shot by the pooch. Now, I’ve never been duck hunting in my life but I’m pretty sure this isn’t supposed to be how things happen. So how exactly did this fellow get shot by his dog? Apparently, he was in a boat with his dog when he decided to get out of the boat and put a decoy in the marsh. He left his shotgun in the boat along with his excited dog. Somehow, while running around the boat the dog stepped on the trigger and the gun fired. Thank goodness it was only birdshot and the owner did have a pair of waders on, which helped mitigate the damage as well. However, he still had to go to the hospital and get 27 pellets of birdshot removed from his behind, which I imagine wasn’t very fun. This accident, like most gun accidents, could have been prevented by following simple safety rules. You see, the first mistake this guy made was that he didn’t engage the safety on his shotgun. Although I’ve never been duck hunting I do have a shotgun for home defense and I do train with it often. And when my shotgun is in my bedroom at night, the safety is on. I don’t want to have to worry about something “magically” getting in the trigger guard and discharging the gun. When I’m training and I’m not firing the gun, I immediately put the safety on. It’s a good habit to develop and ensures the gun won’t discharge when you’re not prepared to fire. The second mistake this guy made and the rule that none of us should ever violate is pointing the gun at something you’re not willing to destroy. This guy obviously didn’t have the gun in his hand, but he had poor muzzle awareness and wasn’t aware that his 12- guage shotgun was pointing at him when he got out of the boat. I don’t care if the gun is lying on your couch or on the seat of your truck and nobody is holding it. You still don’t want to have the gun pointed at you and heaven forbid you should ever look down the barrel. This guy was lucky and this incident didn’t turn out too badly for him. However, the majority of the time when people don’t have proper muzzle awareness it ends up costing them their life or the life of someone they care about. So please remember the four firearms safety rules at all times. 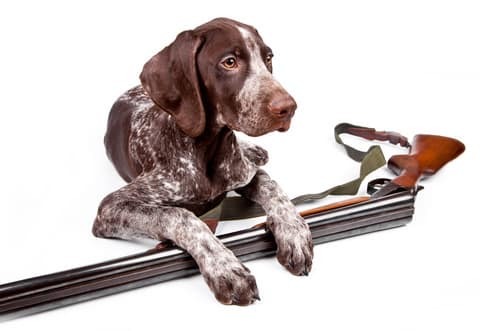 And, be especially careful the next time you leave a loaded gun around Fido.